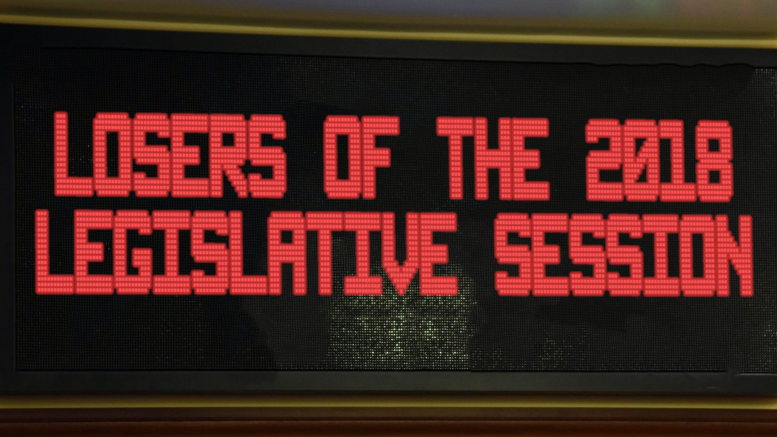 Today we bring you the our list of losers from the 2018 session. These are individuals, groups or feuds that came out not looking so hot by the time the Legislature gavelled out (though some might have found a bit of redemption before the final day). There are some notable omissions from this list, but we didn’t think that an irreverent list making light of the 2018 session was an appropriate place for sexual harassers and accused sexual assaulters. We’ll have something more substantive and serious to say about them soon. By the end of session we were almost feeling bad for the freshman Republican who’s definitely not from Wasilla, but then we went back over what Rep. David Eastman’s done in his two years and all those feelings vanished. His highlights include things like his comments claiming rural women got pregnant so they could get government-funded travel for abortions or his lengthy record of lone no votes, including one he cast against a bill honoring the black soldiers who helped build the Alaska highway. Silver lining: While Eastman has become the focus of derision statewide, by the sounds of things he’s still a star with his constituents. Wasilla Sen. Mike Dunleavy quit the Legislature before the 2018 session even started to focus on his run for governor. Though he’s essentially established himself as the front-runner in the Republican field, we wonder how much he accomplished by sitting out the session. He–and mostly the PAC funded by his brother–have been busy on Facebook, but wouldn’t it have been helpful to have been constantly raking his political adversaries over the coals throughout the spotlight of session? Instead, his pro-PFD platform got taken over in the Senate almost entirely by Democratic Sen. Bill Wielechowski and the other Democrats. The 2018 session came and went without any input from Dunleavy, and it just so happened to be one of the smoother sessions in recent memory (though this, admittedly, probably has nothing to do with Dunleavy’s absence). Dunleavy also made his resignation effective the day before the session began, a move that left his district vacant and without representation for a month. The whole replacement was a pretty miserable process, too. Silver lining: Then again, he would have also probably gotten flack for stumping throughout the session. Before the session began, the Alaska State Officer Compensation Commission voted to eliminate per diem for legislators living close to wherever session is located, which for most of the year is Juneau, starting at the start of the next session. Privately, we heard plenty of legislators say that such a change wasn’t really fair and that there should be some reworking of legislator compensation (far lower per diem and a slightly higher base pay seemed to be what people agreed on). But at the end of the day, no one was really willing to stick their necks out for the three Juneau legislators. Silver lining: At least thanks to the passage of House Bill 44, everyone else will have a ticking clock on their per diem, too. (We’ll admit that Rep. Adam Wool was one of the few on this list that found redemption by the end of the session). Large, much-needed bill is carefully negotiated among stakeholders to reform state’s outdated and cobbled-together alcohol laws. Meanwhile the Alcohol and Marijuana Control Office decides that distilleries can no longer serve cocktails as they had been doing since a 2014 law allowed them to open on-site tasting rooms. Everyone except Rep. Adam Wool says the issues should be kept separate. Wool combines the issues anyways, opening a feud between bar owners (which includes Wool) and distilleries and breweries. The reform bill re-emerges with a fix for cocktails, but a cut in serving sizes for distilleries and breweries. With time run out on the bill (which you really can’t blame Wool or anyone in the House for), the sponsor pulls the plug. Wool was on the receiving end of plenty of ire and scorn for his approach to the issue of whether or not distilleries should be allowed to serve cocktails. There were some pretty bad things said about the bar-owning legislator, but at the end of the day he ended up being the one to make sure the fix got across the finish line as an amendment to another bill. The reform died, but cocktails live on. Silver lining: At least we’ll be able to enjoy cocktails at least until the killjoys at the Alcohol and Marijuana Control Office come up with another reading of the law. There was a lot of animosity between Juneau Rep. Sam Kito and House Rules Committee chair Rep. Gabrielle LeDoux that appears to have mostly stemmed from a fight over the hallway chairs outside Kito’s office. Kito apparently didn’t appreciate the noise of people in the hallway, and LeDoux said that wasn’t his choice to make. It’s one of the more petty fights of the session, but it also seemed to seep into just about everything else. It culminated very publicly with Kito’s walk-out over LeDoux’s changes to the smoke-free workplaces bill. Kito, who lost his chair at the head of the Legislative Council and was the target of particular bad blood after session, is the biggest loser in this feud, but it didn’t do any favors to anyone involved. Silver lining: At least the smoking bill was passed. Similar to the LeKito feud was the brewing fight between Senate Judiciary Committee chair Sen. John Coghill and Mia Costello, but at last this one had a bit more substance. Costello had taken it upon herself to stand up against criminal justice reform and blame it for all the crime in Anchorage, while Coghill–the author of that reform–didn’t want to see it further unraveled. Costello had authored Senate Bill 127, which would be a wholesale repeal of Coghill’s Senate Bill 91, and, surprise, Coghill refused to hold a hearing on it in the Senate Judiciary Committee. That battle culminated in the rolling of Coghill through a procedural rule that bumped it out of committee, but that was too early to declare Costello a winner in the war. Instead, a few weeks later the Senate Finance Committee finally gave Costello her opportunity to make the case for repealing Senate Bill 91. Saying it didn’t go well is putting it lightly. It was embarrassing. Silver lining: The feud was so distracting that Reps. Matt Claman and Chuck Kopp were able to quietly cobble together a “minibus” crime fix with the Senate. The only piece of a fiscal plan that anyone could agree on was a smaller dividend as part of a restructuring of the Alaska Permanent Fund. It’s pretty much been coming since the state’s oil revenue started to dry up, but this year’s passage of Senate Bill 26 made it a reality (even though it’s unclear just how it’ll stand up in practice). That means poor Alaskans will each be giving up the exact same amount of money to the state’s fiscal crisis through cuts to their PFDs as the state’s wealthiest recipients of the PFD. As budget commentator Brad Keithley has frequently pointed out, the impact a $1,100 cut has to the overall income of a low-income Alaskan is far, far greater cut than it is to the top 20 percent of Alaskans. To add to the pain, the state–at the behest of the Republican Senate–has refused to fully fund Medicaid for both the current and upcoming fiscal years. It won’t necessarily impact the ability of Medicaid recipients to get their health care covered–that’s required by federal or state law one way or another–but the late payments have some Medicaid providers worried about whether they can even keep their doors open, which could hurt coverage. Silver lining: We can’t really think of one. Remember that Kodiak Sen. Gary Stevens is running for lieutenant governor? Neither did we. The moderate Kodiak Republican’s announcement that he’d be entering seeking the Republican nomination for lieutenant governor didn’t make much of a blip on political radars, but it did automatically trigger some changes in his committee assignments. He lost his chairmanship of the Legislative Budget and Audit Committee and seat on the Legislative Council. Silver lining: If his run doesn’t go as planned, he still has two years left in his Senate term. 4 Comments on "Red Button: Eight losers from the 2018 session"
Dunleavy tops your list, but is now the front runner on the R side in the Governor race. Finding a solid replacement for him took a month and made all involved look like a joke, including the Governor. Chenault stayed in the House had a miserable time in the minority, has zero name recognition and less funding. But Dunleavy was the Dunce. Fundraising lead, stump speech polished, meetings held across the State. Dunleavy is a great tacitition. It’s now his battlefield. What a joke of an analysis. Matt Buxton – I can’t disagree with your No. 1 pick on the list of losers for the 2018 legislative session, Mike “The Quitter” Dunleavy. May he be hoisted with his own petard before election day. Let’s see – Dunleavy leads in fundraising and current polling for Republican candidates, no other major figure joined the race for governor on the R side, he been able to campaign across the state (basically has had a six month advantage over Chenault, who is currently invisible in the polls and fundraising), and has been able to fill the necessary volunteer positions statewide to run a statewide campaign. Don’t see the downside for the person who is very likely going to win the Governor’s race. I think the damage that Adam did has much larger consequences. Sure he was able to get the distillery issue across the finish line but he essentially killed a statewide alcohol reform effort over nothing. He didn’t do the right thing. At all.